Following a multi-million dollar refit, the 38.11m motor yacht Milk and Honey has now joined the Bartram & Brakenhoff charter fleet with charter manager Pilla Pexton. An all-aluminium yacht, she was built by Palmer Johnson in 2003 to Lloyds and ABS class. MCA compliant, this semi-displacement superyacht exemplifies Palmer Johnson’s wood-working capabilities featuring American cherry with Cuban mahogany highlights. Her warm interior is stunning and comfortable, featuring five spacious staterooms including a full width master on the main deck. 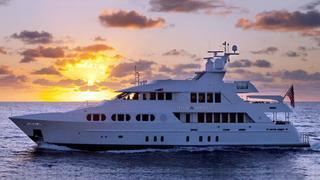 Milk and Honey has excellent interior volumes with generous outside deck spaces for entertaining. She comes equipped with zero-speed stabilizers, passerelle, dive compressor, tender, toys and more. Her well insulated floating interior makes for a very quiet boat and she's keenly available in the Caribbean and New England at $90,000 per week plus expenses.